Some send flowers and cards, but one Norfolk artist decided to mark the arrival of a new royal baby with mud. 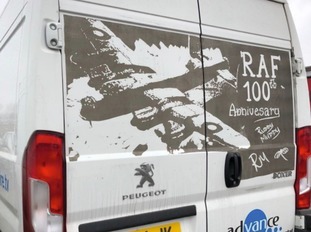 Ricky Minns, also known as Ruddy Muddy, is well known for his artwork made on dirty white vans. He posted the image of the Duke and Duchess of Cambridge holding a newborn on Twitter this morning. He is the artist leading a life of grime creating artwork from the mud caked on the back of white vans.